Happy Monday! 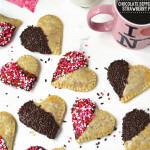 I don’t know why I felt the need to wait until February to start posting Valentine’s Day treats, but I’m excited to share today’s post with you! 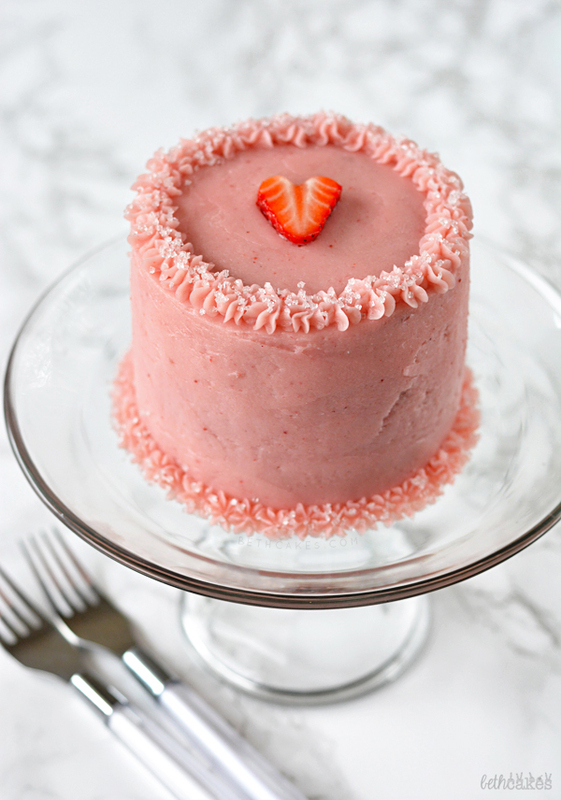 I really love the idea of tiny, two-serving desserts for Valentine’s Day, and I could not get over how cute this tiny cake is. I actually made a couple tiny cakes this weekend, and I think I’m going to have to start making more of them just because. Mini automatically makes things cuter, right? The cake we’ve got here is strawberry, obviously, but it is only made with fresh strawberries. No gelatin mix added or anything like that. Although I did add a small dab of pink food coloring to it, but honestly I wish I wouldn’t have done that. I was going for a brighter, redder pink. Instead they turned out a little dark and grayish and my mom told me the cake layers look like hamburger patties. And then I had to admit it. They do kinda look like patties of meat ready to be grilled. 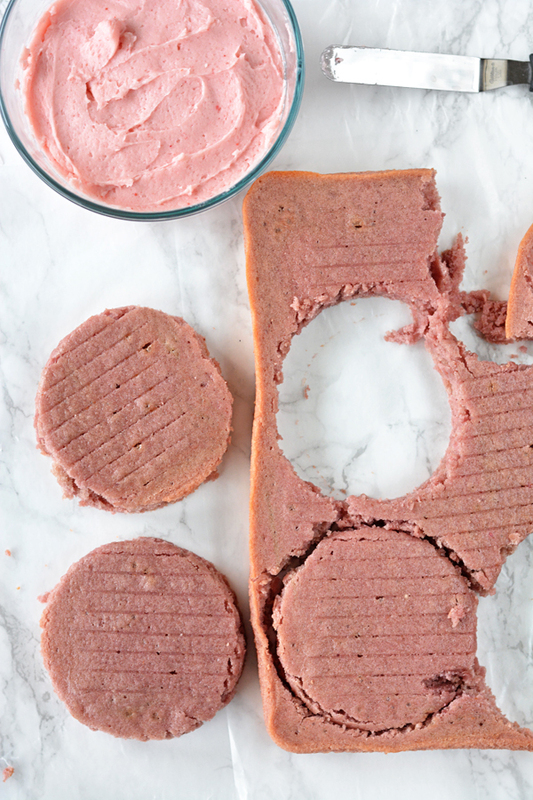 To get a stronger strawberry flavor without adding a gelatin mix, which so many strawberry cake recipes out there call for, this cake gets the flavor from a strawberry sauce. Basically you puree up some strawberries and let it simmer in a pot on the stove until it becomes the texture of jelly. If you were to add straight up pureed strawberries to the cake batter, it would become too thin and you’d probably have to add more flour. By adding a thick jelly, you can all the flavor without messing up the consistency of the batter. 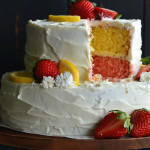 And then you have it, naturally flavored and dyed (if you don’t use food coloring) strawberry cake for two! Also it probably wouldn’t be that bad if you ate this whole thing yourself. You’re allowed to do that on Valentine’s Day. Also make sure to scroll down past the recipe for a fun giveaway! 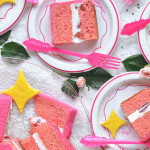 Strawberry Cake for Two + Target Giftcard Giveaway! 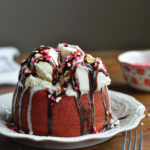 This two-serving strawberry cake is made with fresh strawberries and is the perfect Valentine's Day treat! So you aren't trying to make all of this in one day, it might be easier to make this sauce the day before you plan to make the cake. Puree 2 cups of chopped strawberries in a blender or food processor and add the puree to a medium saucepan over medium heat. Bring the puree to a simmer and reduce the heat slightly to medium low. Simmer, stirring frequently, until it becomes a jelly-like consistency. You can do other things during this time, just don't stray too far from the stove because you'll need to stir this a lot. Spray a 9x13 rectangle pan with nonstick spray and preheat the oven to 350 degrees. In one bowl, combine flour and baking soda. Whisk together and set aside. In another bowl, beat butter on medium-high speed with an electric mixer until smooth and creamy. Add sugar and mix until combined and fluffy. Next add the egg, egg white, and vanilla, and mix well on medium speed. Then add the strawberry sauce and mix until combined. Next add half of the flour mixture and half of the buttermilk. Mix on low until just combined. Add the second half of the flour and buttermilk and mix until completely combined. Pour the batter into the prepared pan and bake for 20 minutes. Let the cake cool in the pan for 10 minutes, then let it cool completely on a wire rack. When the cake is cool, transfer it to a sheet of parchment paper and cut out the circles, which will become the small cake layers. I used a large cup for this, but you can use whatever you have. My cake layers ended up being about 4 inches in diameter. In a medium-sized bow, beat butter with an electric mixer on medium-high speed until smooth and creamy. Add the vanilla and strawberry sauce and mix well. Next add half of the powdered sugar and mix on low speed until mostly combined. Then add the rest of the powdered sugar and mix on medium speed for one minute. Place a mini cake layer on a small cake stand or plate. Spread frosting between each of the layers and around the outside of the cake. I had enough left over to pipe some little borders. Garnish with strawberries or a little strawberry heart. 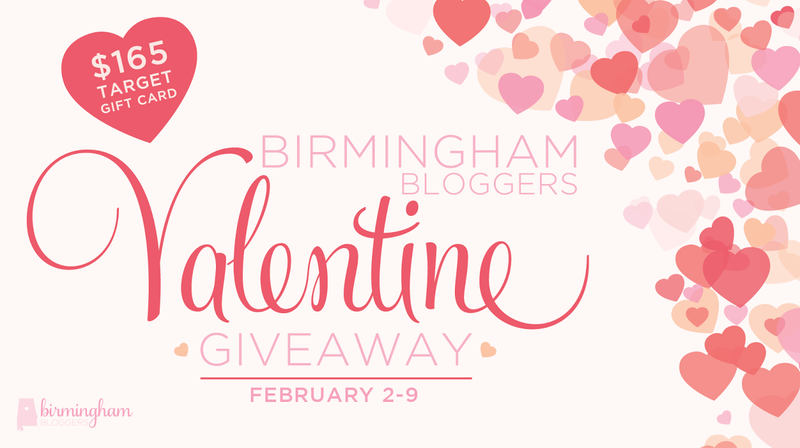 I’m really excited because I’ve teamed up with some local bloggers from Birmingham Bloggers to bring you a Valentine’s giveaway! Enter below for your chance to win a $165 giftcard to Target. Happy Valentine’s Day! 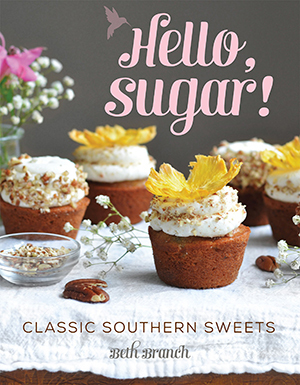 LCB Style, A Pinch of Healthy, The M Studio, Hey There Sunshine, Eat Drink Be Well, Morrell’s Armoire, Fast Foodie, Bethcakes, Blissfully Southern, Lola Charles, The Style Gathering, Shotguns & Seashells, Between the Pearls, Sizeable Chic and Everyday Living. Pretty little cake! I love this little cake and want to dig into it right now. 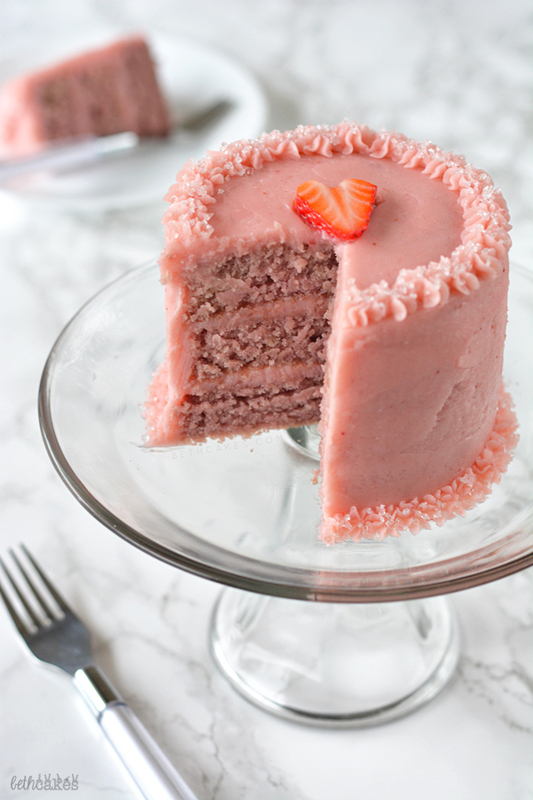 Strawberry cake is the best and I love that you used strawberry frosting too. Pinned! We’re blog twins today! Haha. Thanks for pinning, Rachel! 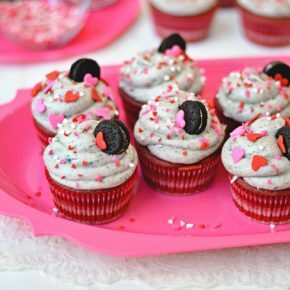 I adore mini cakes, especially on Valentine’s day. These are super cute! PERFECT! Cutest little cake EVER! What a cute little cake! Pinned. So so beautiful!! 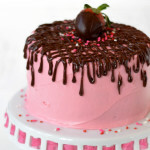 I adore strawberry cake, it is one of my favorites! 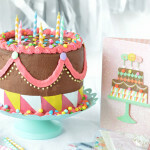 This cake is seriously so darling!! Ahhhh! I love how cute this cake is! I need to make more smaller cakes. Pretty sure smaller cakes = happiness. 🙂 Thanks, Zainab! This cake is amazing! I love that you used all fresh strawberries!!! This cake is beautiful. 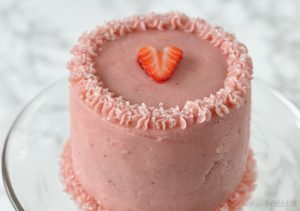 I love all these pink, berrylicious desserts I see lately on every blog, you can tell it’s Valentine’s Day soon. Such a lovely time of the year and such an inspiration for bakers. Thanks for sharing! These are adorable! And mini things totally taste better. I don’t know why, but it’s true!! Okay, Beth, this is the CUTEST! When I saw the pieces coming together on Instagram I knew you had a good thing going 🙂 I love how perfectly pink this cake is! Mini things are always cute! These look yummy! I really like how used fruit puree instead of jello or something like that. Is there a way to make this just in the 9×13 pan to feed more than 2 people? Would you double the cake recipe or leave it? I need one to feed 4 and I’m too lazy to make 2 separate mini cakes. The struggle.